Today I wanted to share with you a brand I only discovered fairly recently. They are called The English Soap Company and create the most luxurious perfumed soaps that are intensely moisturising on your skin as well as fragranced soy candles. You are probably all aware by now how my love for candles and all things fragranced boarders on obsessive so I was really excited to find a new brand to try! 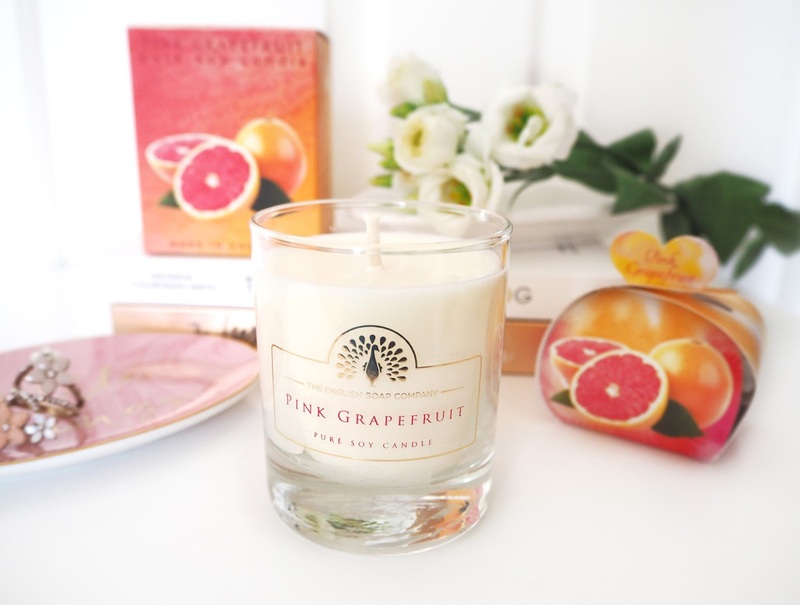 I've been trying out their new Pink Grapefruit Collection* which is so up my street as I love zingy fruity fragrances especially coming into Summer! I find these kind of scents can have an awakening effect really give me a lift particularly in the mornings when I'm starting blog work. I've also got to mention the packaging, isn't it beautiful?! The ombré pink to peachy orange is so gorgeous, who wouldn't love to receive that? "A wonderful zingy citrus fragrance to wake you up first thing in the morning, an enlivening scent that will keep you feeling fresh throughout the day." This Pure Soy Candle has a burn time of 35 hours which I think is really great considering the value is only £9.95! It looks so pretty sitting on my dressing table and is very instagramable too which is a definitely requirement in my life, I don't know about you?! The fragrance didn't disappoint, I found the candle had a decent throw when I was burning it in my bedroom. As it's small though I'd recommend using it in a smaller room as oppose to say an open plan living room if you are looking for a good fragrance hit. I love how the soaps are packaged like little carry cases. The Large Soap is a great size for the bathroom and will last ages, priced at £5.99. The Guest Soaps are four individual heart shaped soaps which are super cute! These are priced at £2.95. Both soaps contain the same beautiful perfume as the candle and are full of Shea butter and essential oils so feel incredibly silky and doesn't leave my skin feeling dry afterwards. I think all of their pieces would make wonderful presents for loved ones or those 'just to say' gifts for say a neighbour where you not quite sure what to get them! Next on my list to try I think are their Oriental Spice & Cherry Blossom Candle, White Jasmine & Sandlewood Candle and the Forest Orchid Candle! You can shop The English Soap Company soaps online here. You can also follow them on Facebook, Twitter and Instagram to keep up to date with their latest news and launches. Which is your favourite fragrance from The English Soap Company? Would you try the Pink Grapefruit Scent? I am a candle lover, I would love to give these a try ! I have a little bit of an upset Chin with candles. And I especially love so we candles. Have at this one smells delightful. Oh I bet these would smell amazing! I love that its a soy candle! I love the grapefruit smell...and would love to try the soap too in the Pink Grapefruit Scent! !